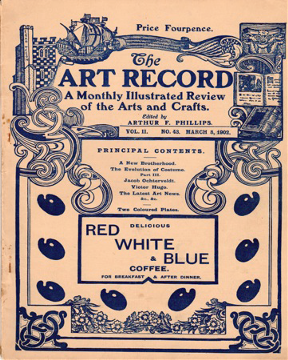 The period covered by Arts:Search is 1901 - 1902. Edited by Arthur F. Phillips. Little known, short-lived review of the current British art scene. It is unclear why this magazine survived for such a short period (February 1901-May 1902). It attracted a fair amount of advertising and at only four pence an issue, it wasn’t over-priced. The issues we have digitized contain substantial articles on Herbert J. Draper; Calderon’s School of Animal Painting; George Sauter; Sir Noel Patern; Francisco Zurbaran; Onslow Ford; the New Brotherhood (W. Denis Eden, Frank C. Cowper and C. Lindsay Smith, the latest generation of Pre-Raphaelites); the architects Parker & Unwin; Jacob Ocherveldt; and Edward Gordon Craig. Also includes art news, and book and exhibition reviews.